If you are looking to replace a missing tooth or teeth and are considering dental implants, it’s a good idea to know what you are getting into. Knowing what to expect will help you through the process. As with most cosmetic dentistry procedures, there are several steps that will be done by our specialist. At Library Plaza Dental, we are lucky enough to have on staff Dr. Eman Shirai, DDS, who has a tremendous amount of clinic experience in the field of implant dentistry. He’s even been recognized as one the the country’s “Top Dentists” by the Who’s Who Guide. Additionally, he’s been awarded the distinction of being a “Diplomat of the International Congress of Oral Implantologists.” His interest in implants extends to teaching dentists around the world how to perform them, thus being a part of smiles the world over. In our last blog, we covered what would happen if the dentist determines that the jawbone is insufficient to hold the implant anchor at your initial evaluation. After your bone graft has healed and the graft has grown to be integrated with your existing bone, in a process called osseointegration, the next step can take place. 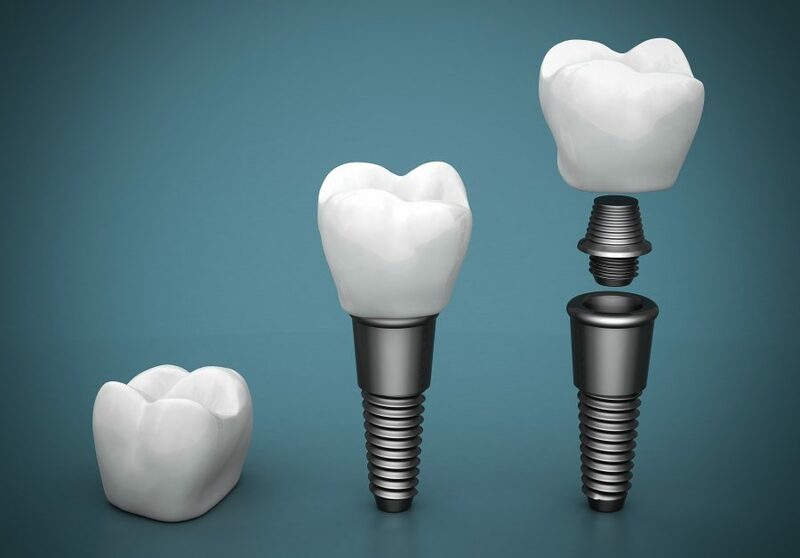 Placing the metal post that will anchor your tooth is the next step in the implant process. A small incision will be made in your gum. At first, a small guide hole will be drilled, and subsequently, larger bits will be used to drill the hole to be the right size. The post will then be screwed into the bone. An X-ray will be taken to ensure proper placement. When the dentist is sure the post is in the right place, they will sew your gum closed. The post needs to be allowed to integrate with the jaw bone. This can take anywhere between three and six months. The abutment is the top part of the anchor to which the artificial tooth, or crown, will be attached. In some cases, it is put in when the post is put in, and in other cases, it will be put in when the anchor post has integrated with the jaw bone. The artificial tooth, or crown, that will be placed on the abutment can be made to look extremely natural, and even to match your other teeth. Because it is attached to the post that is in the gum, the crown looks extremely natural. When you have your crown in place, your smile will be amazing, and you’ll never have to worry about denture fixtures, losing your bridge or any of the hassles that come with the other methods of replacing missing teeth. And a dental implant will help keep your jaw bone healthy for years to come instead of being reabsorbed into your body. To find out if you are a candidate for a dental implant, call for Library Plaza Dental to schedule an appointment.